In this third part of the C2000 Solar MPPT Tutorial, the software will be looked at in greater detail. This will entail a look at the Perturb & Observe algorithm, ADC code and timing code to ensure everything operates in a controlled manner. The software is based around a Perturb and Observe (P&O) algorithm, the P&O algorithm falls under the category of a hill climbing algorithm. Hill climbing algorithms are named so due to the algorithm taking steps over sampled data to reach a desired value, in the case of the P&O this takes steps towards the MPP by increasing or decreasing the duty cycle. There are other hill climbing algorithms such as dP/dV Feedback Control and Incremental Conductance, I intend to revisit these and write code at a later date, but for now will focus on the P&O. Some further information on MPPT algorithms can also be found here. The algorithm can be confused and track in the wrong direction, this can occur under fast changing irradiance conditions, the severity of this confusion depends on the P&O setup i.e. step size and update frequency. The algorithm oscillates around the set point showing characteristics of an on/off controller. More on this can be found on a previous tutorial I wrote regarding PID control, which can be found here. 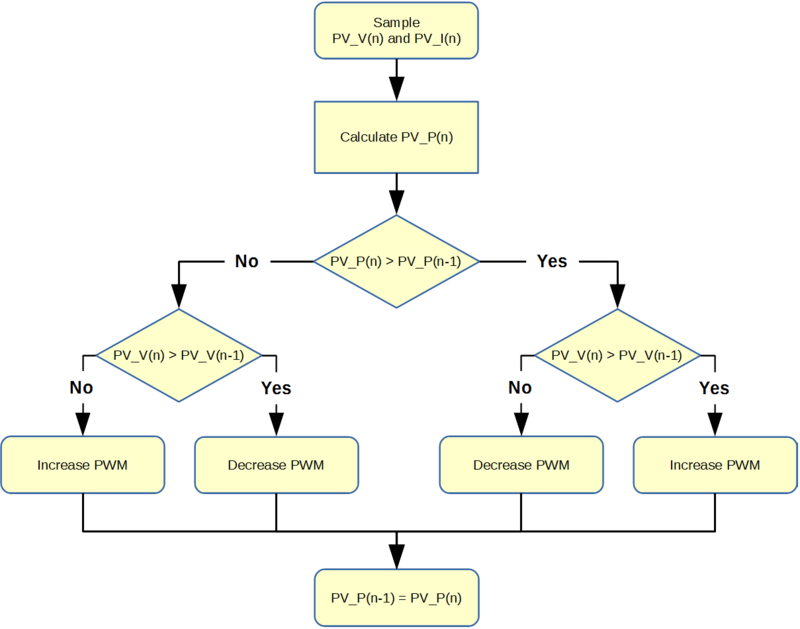 As can be seen from the flowchart the algorithm is fairly easy to follow, turning this into C code is also relatively easy, the final C code P&O algorithm can be seen below inside the function Adj_PWM(). So lets now run through the code briefly starting with line 3, this basically assigns the value in the counter compare A register to variable PWM_Temp. PWM_Temp could simply be assigned to a temporary global variable, but I chose to get it straight from the register in this case. Lines 5 to 24 form the main body of the algorithm, looking back at the flowchart the first two steps “Sample” and “Calculate” are carried out elsewhere in the ADC section of the code. Lines 5 to 14 are illustrated by the right hand branch of the flowchart and lines 15 to 24 are illustrated by the left hand branch of the flowchart. You have some simple if and else statements that determine which direction the algorithm takes, which is dependant on the sampled ADC data. 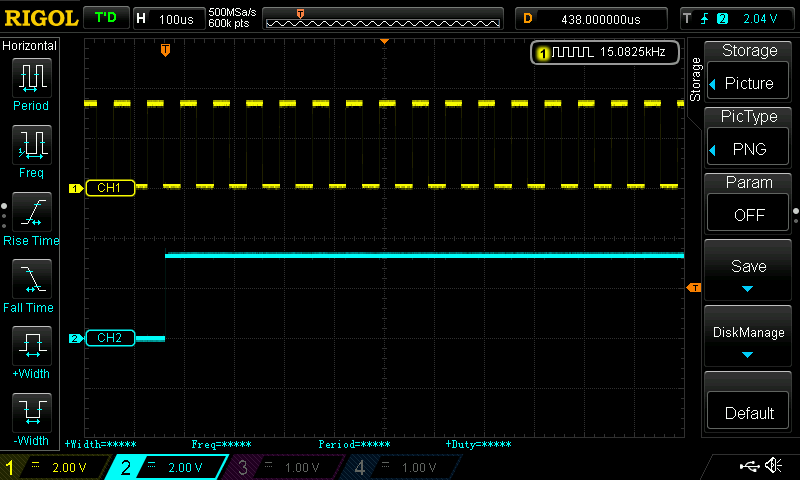 The result of these steps will either increase or decrease the PWM duty cycle, this increase or decrease determines the step size and in this case that value is 2. The next block of code from lines 26 to 31 are used to prevent the duty cycle from reaching too large, and too small a value. This was used during tuning, but also serves to provide some boundaries for the PWM, for example the duty cycle for the half bridge MOSFET drivers cannot exceed 99%, or the boost function will not operate correctly. Lines 32 and 33 are used to update the duty cycle to the counter compare A registers for PWM1 and PWM2, both are the same duty cycle but PWM2 is 180o out of phase with PWM1. Line 35 then assign the latest calculated solar panel voltage IP_Volt to the variable Old_IP_Volt and line 36 assign the latest calculated solar panel power New_PW_In to the variable Old_PW_In, both these variables are then used when the Adj_PWM() function is called again. 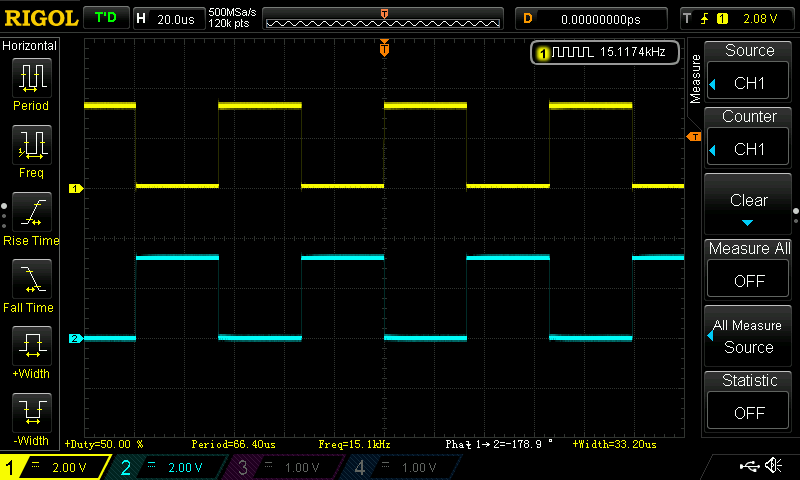 In order to help visualise the two PWM signals, the below image shows an oscilloscope trace with PWM1 in yellow and PWM2 in blue, both are set to 50% duty cycle and PWM2 is out of phase by 180o with PWM1. So starting with lines 3 to 6 these are the local variables used for the function, the two floats are used to store the ADC values and the two integers are used to determine how many samples in the for loop. The float in line 4 is a float array with four arrays, now the same result could be achieved with four separate floats. I have left it as a float array for now, but if four floats were used the code should be optimised, by using 64 samples the following division of 128 (lines 23 to 26) could be substituted with a right bit wise shift of 7. Lines 8 to 21 consist of the for loop, this uses the integer i as a counter and numberOfsamples as the count value. Inside the for loop shown on line 10 this statement will wait until the next PWM trigger is received, which then initiates the ADC SOC channel number 0, once ADC channel 0 is finished it initiates channel 1 and so on and so forth. The samples are saved in each of the channel numbers registers, then using the += addition assignment operator are added to the sum_of_ADC_samples_Array[n]. So an accumulated value is built up of the total samples every time the for loop is executed. In addition there are 8 ADC channels being sampled, channel 0 to 7, but only 4 samples are accumulated so ADC channel 0 and 4 are added to sum_of_ADC_samples_Array and channel 1 and 5 are added to sum_of_ADC_samples_Array and so on and so forth. When the ADC channel sampling sequence has finished, the trigger flag for the SOC sequence is cleared (line 20) and the loop waits for the next trigger event from the PWM. Once i reaches 64 the loop is exited, each of the of the sum_of_ADC_samples_Array[n] now have 128 accumulated sample values in. Lines 23 to 26 divide the sum_of_ADC_samples_Array[n] by 128 and assign the value to ADC_An floats. Lines 28 to 31 convert the new floats to real world voltages read on the GPIO. Lines 33 to 36 then use constant values calculated from the electronic component values in the circuitry, to convert the floats to actual voltages and currents sampled in the circuit. Lines 38 to 40 simply convert the input voltage and current to an input power and the output voltage and current to an output power. The timing code is quite critical as it determines the update frequency of the MPPT, it must also ensure the code does not overrun and cause unpredictable behaviour. The internal timer module was used, Timer 0 was set-up to trigger an interrupt every 100mS or 10Hz. The interrupt code is shown below. When the interrupt is called an integer called SysTick is set to one, then the interrupt flag is cleared allowing the interrupt request to be executed and exited quickly. Inside the main function there is a continuous while loop, the following code is run inside this loop. Every time the interrupt sets the integer called SysTick to one, it allows the functions Data_Update() and Adj_PWM() to be executed, once these functions have completed SysTick is set to zero. There are some additional lines of code on line 5 and line 10, these are used for testing and allowing the code execution time to be displayed on an oscilloscope. The code on line 5 switches GPIO pin 19 high, then the code on line 10 switches GPIO pin 19 back to low, so a square wave pulse is produced and the pulse width gives an indication of the code execution time of the functions Data_Update() and Adj_PWM(). The following images show captures from an oscilloscope. This first image shows the 15kHz PWM being displayed on channel 1, the individual wave pulses are not visible as the time base is set to display channel 2. The blue trace shown on channel 2 can be seen to have a frequency of 10Hz, with a pulse width of 4.4mS, so the functions Data_Update() and Adj_PWM() take 4.4mS to execute. Putting this into context there should be 128 ADC samples captured, taken from 64 triggers of the PWM signal, therefore 64*66.67uS (one 15kHz cycle) = 4.27mS. A single ADC sample and conversion takes around 650nS, if we multiply that by the 8 samples, a conversion is being completed every 8*650nS = 5.2uS (it will be faster than this due to ADC pipelining effects). 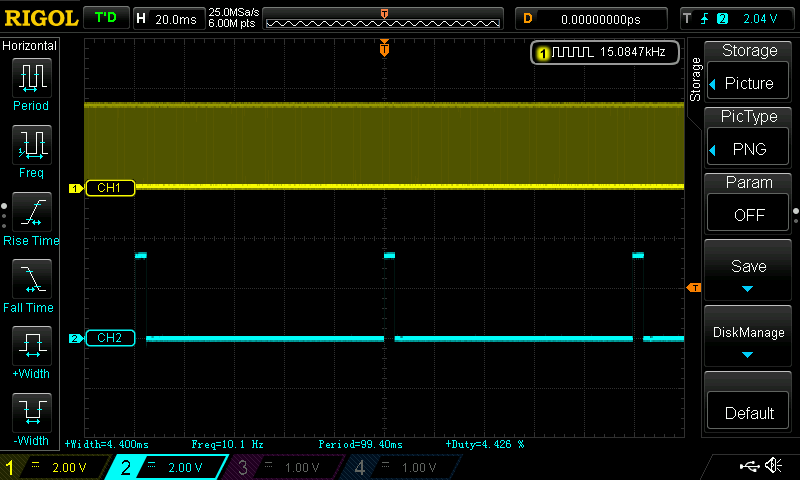 It can be clearly seen that there is plenty of room for more oversampling if required, as the 5.2uS sample and conversion time easily fits inside the 66.67uS window of the PWM trigger. There is also a small amount of code overhead being added artificially by toggling GPIO pin 19, which is not significant but something to be aware of. The second image has a smaller time base setting (100uS) effectively zooming in, which allows the individual pulses from the 15kHz PWM to be visible. So going back to the step size of 2 shown in the Adj_PWM() function, this can be put into context when the maximum duty cycle value as a variable, for 100% duty cycle equals 1000. Therefore with a PWM update frequency of 10Hz and a maximum step size of 2, this equates to a maximum duty cycle change of 2% per second. I captured some video which shows 3 variables being graphed in Code Composer Studio, these variables are PV Power, PV Volts and the Duty Cycle. The video also demonstrates the MPPT in action under simulated fast changing cloud conditions, as well as some natural cloud. There will be one final part to this series of tutorials this will cover some of the set-up and testing, and will also include a link to the full C code for the project. 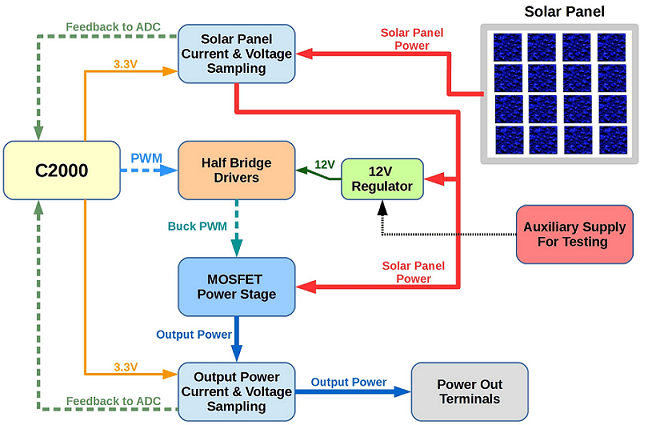 This series of four posts will cover a project build for a C2000 Solar MPPT Tutorial. The Maximum Power Point Tracker (MPPT) circuit is based around an interleaved synchronous buck circuit topology. The microcontroller used is the Texas Instruments (TI) C2000 family, the C2000 Launchpad is used which has a TMS320F28027 chip on-board. Considerable research was carried out on this project, as there was no prior knowledge of the C2000, all the relevant peripherals were tested separately and then brought together and tweaked for the final code. 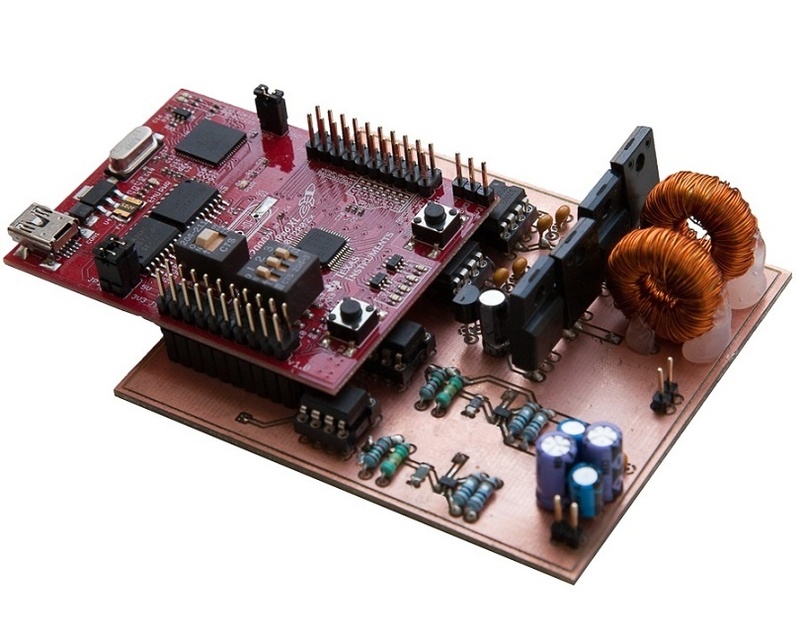 TI provides all the documentation required, which can be found here and for this tutorial the ADC, ePWM and the F2802x Peripheral Driver Library Users’ Guide were referenced. The C2000 solar MPPT tutorial can also be used as a guide if designing a circuit for other microcontrollers such as Arduino, as the electronic principles and some of the code is transferable to any platform. The image below shows the final prototype MPPT PCB with the C2000 Launchpad secured on top via the header connections. The video below shows the system set-up, allowing the Perturb and Observe algorithm to be tuned. There is also a second video demonstrating the algorithm tracking the maximum power point of the solar panel, this can be found on my YouTube account and will be embedded in the final tutorial. Maximum power point tracking is employed, to ensure the maximum power is extracted from a solar panel. 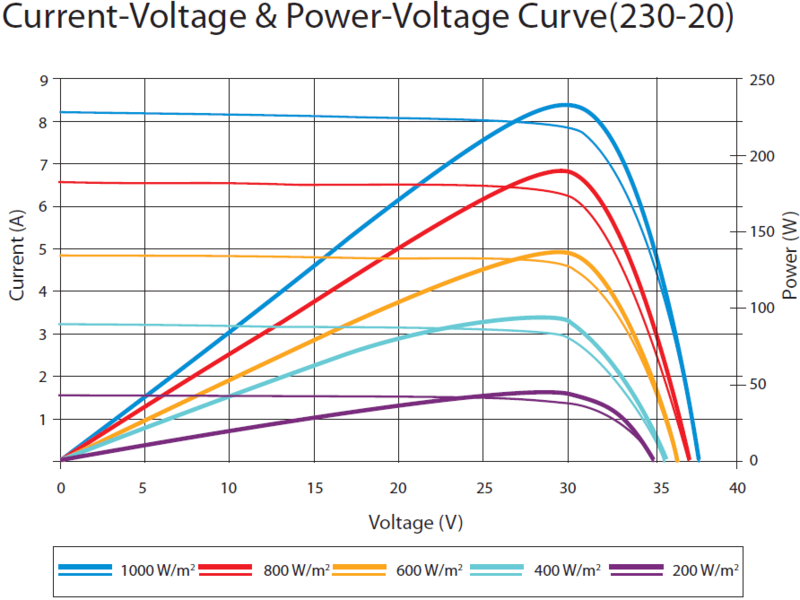 In order to understand this further we first need to look at the power curve characteristics of a solar panel, the image below shows a Suntech STP230-20Wd (230W panel) power curve. The maximum power point (MPP) of a solar panel lies at the knee of the current and voltage curve. Reading the datasheet on the Suntech panel tells us that Vmp (voltage at maximum power point) is 29.8V and Imp (current at maximum power point) is 7.72A, locating the intersection point of these two values, it can be seen that the MPP is at the knee of the curve. The graph also illustrates that the voltage variation is much less compared to the current only with differing irradiance, however the current varies linearly with solar intensity. Temperature also affects the power output from a panel, current increases slightly with an increase in temperature, whereas voltage decreases with an increase in temperature. As the voltage is affected by temperature more than the current, voltage calculations need to be considered when large string arrays are used, to ensure the system meets the requirements of the inverter used. The panel has an internal resistance which changes dynamically with differing irradiance levels. So if a static load is connected directly to a panel and its resistance is higher or lower than the panels internal resistance at MPP, then the power drawn from the panel will be less than the maximum available. Taking a simple example under bright midday sun, say we connected the Suntech STP230-20Wd directly to a 12V lead acid battery, the panel voltage would be dragged down near to the load voltage of the battery as the batteries resistance is lower than the panels. With a quick calculation the panel is now outputting 12V and 7.72A, therefore 93W, this equates to a loss of 137W or 60%. Obviously this is an extreme example, but even using a 24V battery would still equate to a 20% loss, which is far from efficient. This is where MPPT comes into play. MPPT circuits can be based on various switch mode power supply (SMPS) topologies, they generally have a fixed frequency but varying duty cycle. The duty cycle is controlled via an algorithm so as to track the changing MPP, the output power is determined by the efficiency of the circuit and usually closely matches the incoming power within 3-10% (typical losses). The output voltage and current will not necessarily be fixed under changing irradiance conditions depending on the system employed, so further circuitry maybe required or a more elaborate algorithm. 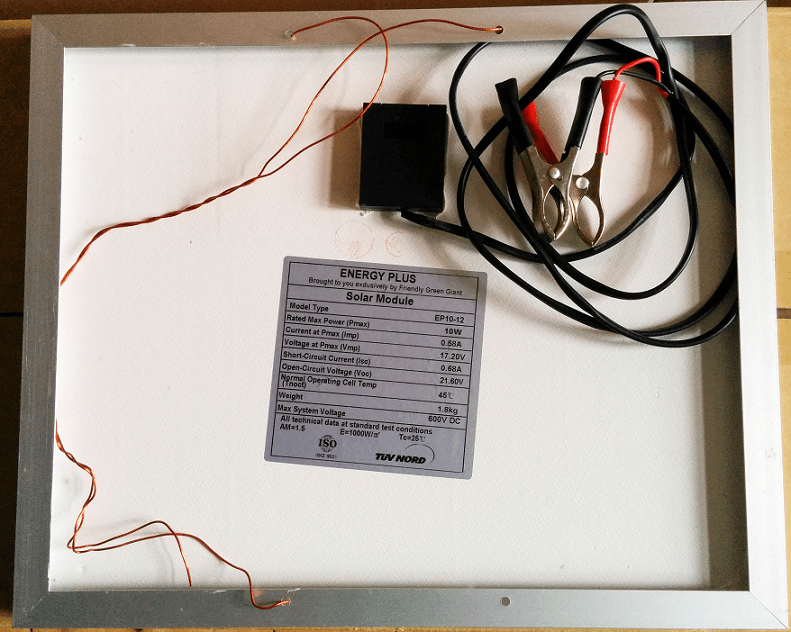 The solar panel in the diagram will be represented in real life by a 10W panel purchased from Ebay, this has a Vmp of 17.2V and an Imp of 580mA. Four ADC inputs and 2 PWM outputs will be used on the C2000. The input voltage and current and output voltage and current will both be monitored, so the input and output power can be determined. A pair of half bridge driver integrated circuits (IC) will be used to drive the four N-Channel MOSFETs. There is also an auxiliary supply, this was used to power a 12V linear regulator which powered the half bridge drivers. The 12V regulator could also be powered directly from the panel, which was used in testing under bright sun conditions. The chosen SMPS topology will be based on a synchronous buck converter circuit, there will be two of these in parallel forming an interleaved design. Using an interleaved approach is over kill for the 10W panel prototype, but it gives the system scalability for future iterations. The synchronous buck design was chosen as it offers a higher efficiency, these design choices will become clear as the tutorial progresses. The buck converter circuit will be over viewed as this forms a large part of the system design, this will naturally lead into the advantages of the synchronous and interleaved design chosen. A boost circuit could quite easily be implemented in place of buck design, but in this case the target output voltage was 12V. A buck converter is basically a small DC to DC converter. The main principle at work in a buck converter, is the tendency for an inductor to resist changes in current. A buck converter output voltage will always be lower or the same as the input voltage. A simplified schematic of a buck converter can be seen in the below image. A buck converter relies on a switch to change or reduce the current flowing through the inductor, the switch usually takes the form of a MOSFET (Q). When the MOSFETs gate is saturated effectively closing the switch, current flows through the inductor (L) in a clockwise direction into the load (R) and also charging the output capacitor (C). At this point the voltage on the cathode of the diode is positive, therefore the diode (D) is blocking any flow of current and is said to be reverse biased. The Instantaneous current flow into the load from Vin is slow, as energy is stored in the inductor as it’s magnetic field increases. So during the on phase of the MOSFET, energy is loaded into the inductor. When the MOSFET is switched off, the voltage across the inductor is reversed. The inductors magnetic field begins to collapse, this collapse releases the stored energy allowing current to flow from the inductor into the load. The diode now has a negative voltage on the cathode so becomes forward biased. Therefore the inductors discharge current flows in a clockwise direction through the load and back through the diode. Once the inductors energy has fallen below a certain threshold, the load voltage falls and the capacitor becomes the main source of current, ensuring the load is still supplied until the next switching cycle begins. To ensure Continuous Conduction Mode (CCM) the inductor must not be fully discharged before the MOSFET is switch on again, and the cycle repeats. 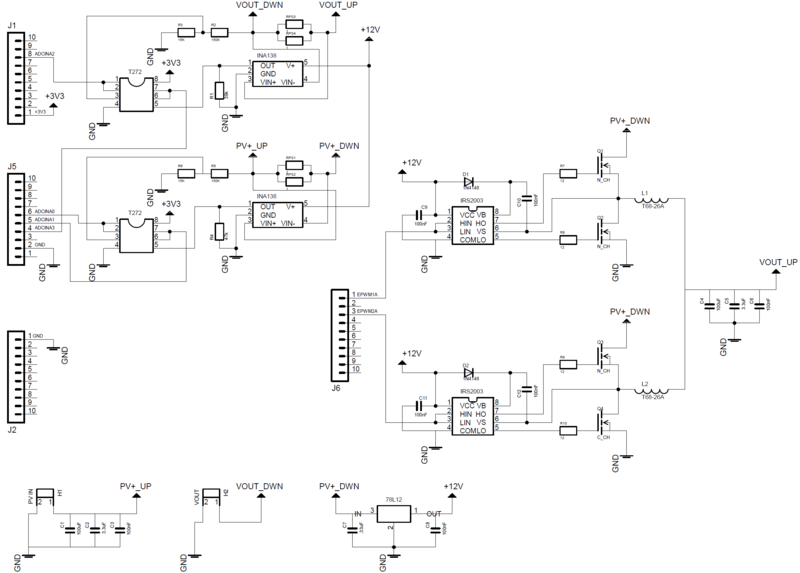 Now that the basic concept of a buck converter has been explained the synchronous design can be covered. The synchronous design simply replaces the diode with a second MOSFET, this eliminates the losses incurred by the forward voltage drop across the diode, thus making the circuit more efficient. This is slightly more complex to implement, as the second mosfet switching needs to be carefully timed with the switching of the first mosfet. It is essential to ensure that both are never on at the same time, or the current will have a direct path to ground, effectively causing a short circuit. The MOSFET switching is effectively 180 degrees out of phase, with a short delay period between each transition referred to as a Dead-Band. A dead-band is usually a common feature of most half bridge drivers, the C2000 also allows for the dead-band to be programmed in and tuned, so in reality with modern microcontrollers this is quite simple to implement. The interleaved design simply takes two synchronous buck circuits and places them in parallel, the main components MOSFETs and inductor are individual to each circuit, but they share a common input and output as well as the same input and output capacitors. Using an interleaved design reduces the current ripple by half, as each interleaved phase shares the total current. The shared current allows smaller inductors and capacitors to be used, which can also reduce system size and cost. Additionally this systems PWM frequency was chosen to be 15kHz as it reduces the switching losses in the MOSFETs, but increases the current ripple and also the inductor size. By using the interleaved approach it then helps to negate these factors. These trade-offs will be covered in more detail in the hardware section of this tutorial, where MOSFET losses will be covered. As mentioned previously the solar panel was purchased from Ebay for around £20. 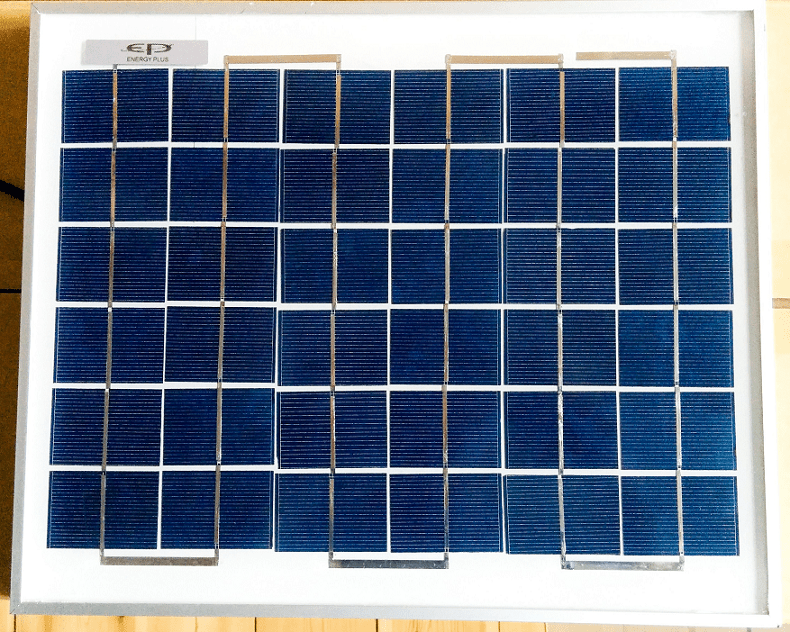 It’s a polycrystalline panel, which is encased in an aluminium frame and comes with 2 large croc clip leads and a small diode box. The panel seems pretty good quality and appears to be weather proofed, the diode box is not sealed very well but as it sits under the panel I don’t believe there would be any issues. Have enclosed 2 shots of the panel, and I can probably dig out the links to the company if anyone is interested. The next part of this tutorial will go more in-depth into the circuit calculations and schematic design.